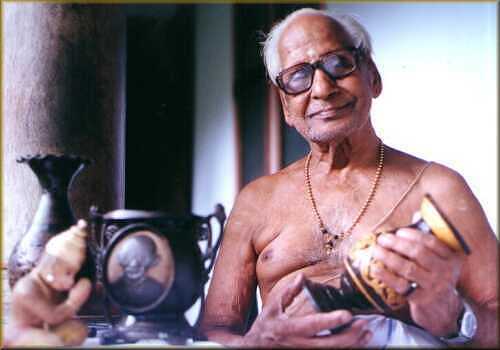 Late Shri C.M.Neelakandan Namboodiripad was born in 1911 in Malappuram district of Kerala. He had education in the vedas as per the tradition of Namboodiri families. At the young age of 14 he showed creativity in carving things from coconut shells, using a single knife. Later because of the keen interest in the craft, he developed his skill to perfection. He has imparted thorough training to more than 18 trainees of the younger generation. Using the hard outer shells of the coconut he used to make cups and spoons. The shell which is highly resilent is often entrically carved. Bowles, carved flowervases, table lamp stands, pens, necklaces, lockets, rings, chess board, ashtrays, teapoys, soap box and other household and decorative articles are made by him from the coconut shells. 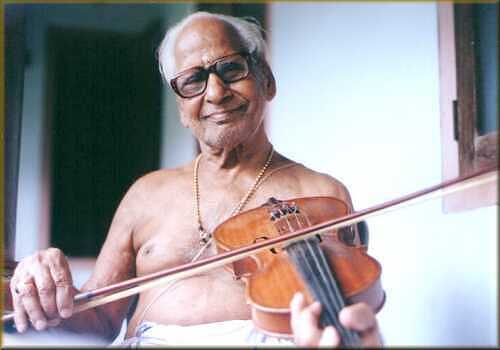 Apart from coconut shell handicrafts he made violins using different types of woods mainly 'Jackfruit tree'. Jackfruit tree wood was not used by anybody for making violins. Also he made Kathakali crowns, costumes, other musical instruments like Veena and Thamburu, 'Vadyas' like Chenda, Edakka and Maddalam etc. 'Chendas' and 'Maddalams' made by him were donated to famous Kathakali centres, namely, Kerala Kalamandalam Cheruthuruthy and P.S.V. Natyasangham Kottakkal. He donated a 'Krishnamudi' to Guruvayoor Kathakali club and had received an award of 'Silpakalanidhi' from the club. In 1993 C.M. 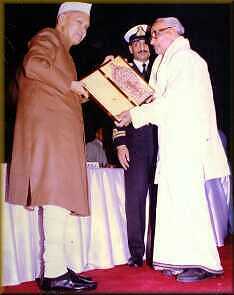 Neelakandan Namboodiripad received the National Award for excellence in Coconut Shell Craft from then Honourable President of India, Dr. Shanker Dayal Sharma. His expertise was also spread to photography, ballets etc. In photography he was encouraged by Mr. Rama Poduval, father of the famous photographer Rajan Poduval. His stage settings for ballets were very attractive and perfect and was appreciated by many famous drama artists. He had presented his craft works to many eminent personalities like Jawaharlal Nehru, V.V. Giri, K. Karunakaran, Mathrubhumi former Managing Editor V.M. Nair etc. Shri C.M. Neelakandan Namboodiripad expired on 6th of January 2011.